Last week, when I was at the annual conference of the Science Teachers Association of Ontario, I attended a luncheon sponsored by Smarter Science. I was joined at the table by a few pre-service teachers. STAO does a nice job of getting pre-service teachers out to their conference, by providing reasonable rates for them to attend. We had a few speakers give short talks about the importance of science education, and how it’s changing in profound ways. The move from memorizing content, content, content to a more balanced approach that also emphasizes skills, critical thinking and the processes of science. During our conversation, one of the young teachers asked me how we could balance that load of content v.s. process in a working classroom. Being one to never miss an opportunity, I turned to her and asked her a question. Me: "Let me ask you something. Tell me what you remember from your high school science classes." Her: "I remember memorizing lots of things, and having tests on them." Me: "Tell me one thing you memorized." Her: "I can’t, I don’t remember them now." Me: "Ok, then tell me what you do remember doing in science class." Her: "I remember this field trip we took to a local forest. I remember doing this project with my friend. I remember some of the labs and things we did in class." Me: "You’ve just answered your own question. Do that. Teach that way. Do what your students will remember, and don’t get hung up on the things that are forgettable." I think she understood what I was getting at, but the hard part is yet to come. She has to learn to make that leap and let go of the fear of ‘not covering something’ in her class. I hope she succeeds, and I wish her the best of luck. I noticed a post by @royanlee over at his blog, where he talked about his kids still getting much enjoyment out of a piece of analogue technology, in his case it was a paper book, rather than a digital one. I’m not sure about the definition of analogue v.s. digital, but I totally get the concept. So, of course, that got me to thinking. And my favorite pastime, digital or non, is music. 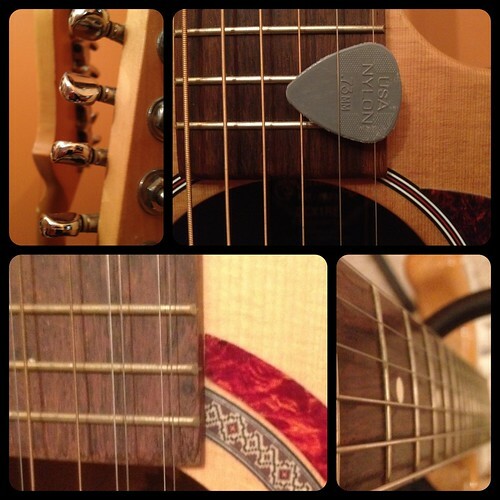 I love playing guitar, and I have several of them. Acoustic, Electric, 6-string, 12-string, steel-string, nylon-string. You get the idea. There’s even a few mandolins in my basement music room for good measure. There is not much that can beat the feeling you get from just a few minutes of picking up a beat up old acoustic guitar and strumming away at the end of a long day. It rocks. In every sense of the word. Honestly, I’ve never liked much digital based music, house, electronica, rap, dance etc… Just never enjoyed it. Give me a singer-songwriter with an old guitar any day. I have started playing with using iDevices for making music, but more often than not, find myself plugging a real instrument into them to record things, rather than use the digital instruments. There is just something so satisfying about making the music yourself, no matter how much it doesn’t sound the way you wish it would. And don’t get me started on Guitar Hero. So, to continue Royan’s meme, I took a montage of photos of some of my instruments, and assembled them below. I’ve been a member of the Science Co-ordinators and Consultants Association of Ontario for about 3 years. Up until last year, I could say that I was a science and technology consultant. Now I’m officially known as a curriculum consultant, with all the ambiguity that is contained therein. I think that its fair to say that the subject specific consultant is a disappearing job title in Ontario school boards. Not that this is all bad, as the boards have to focus on some things more than others, given the realities of funding and Ministry priorities. However, at least some of the time, it’s important to give a voice to the subject specialties. SCCAO works hard to try and bring that Science and Technology voice to different areas. At least twice a year, they bring together science focused people to discuss the burning educational issues of the day through the lens of the science curriculum. We’ve tackled all sorts of topics this way. Tomorrow, we have our annual one-day mini-conference as a lead up to the much larger STAO conference in Toronto. Our day is divided up into a few different sections, but the two mains ones have to do with Assessment of the Inquiry process, and Safety in Science and Technology. Both topics are very important. The assessment topic is one that will focus on science as a vehicle, but will have implications to many educators who have an inquiry focus in their classrooms. The safety discussion will look at the recently published Safe ON Science document by STAO and we’ll be looking at issues around the province in relation to that. We hope to have a Livestream running through the day, so if you want to drop in and listen in, feel free. You can visit the SCCAO website, or the Livesteam.com/SCCAO feed to catch up. Many teachers used to be the students who were good at the system. I think that’s a fair statement. I know I was. I didn’t have to work too hard in school, it came fairly easily to me. I got by, played the game, did fine, went to university, and the pattern repeated. How many students become teachers? What’s the ratio? According to World Bank, there are about 34 million people in Canada, and according to Stats Canada as of March 2008 there were about 5.2 million students in Canada, and 692,000 teachers. This means that currently about 2% of the population of Canada are currently in a classroom as a teacher. So does this mean that the ones who are in the school system as teachers and administrators are the 2% that succeeded under the system, and therefore we are less likely to think that the system needs an overhaul and change? With all the Occupy Wall Street protests around North America pointing out that the top 1% of earners are in control of the majority of decision making, maybe it’s worth a few minutes to consider this in an education context. Are WE the 2%? If so, what do we do now?